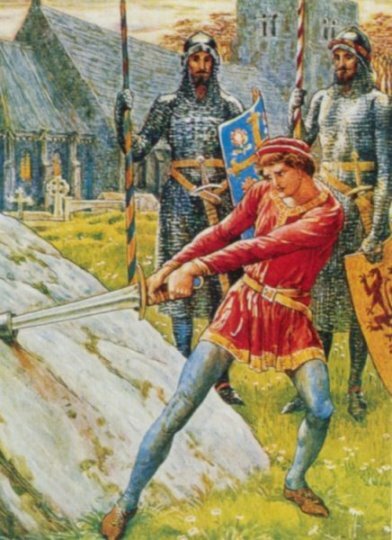 The drawing of the sword out of the stone is traditionally seen as a test for kingship—one of many Celtic tests for ones suitability to be declared king. Only the rightful heir to this position, which conferred heroic and godlike attributes, could perform this deed. As the heroic-god king, Arthur’s authority comes not from his legal position per se but from the way he used his position. He is characterized as excelling above “all other princes in courtesy, prowess, valor and generosity” (Markale, 1994, p 141). Indeed, his sense of nobility and chivalry set the tone of his court, at least before jealousy and betrayal took hold. However, in reality according to Celtic traditions , kings were also bound by a myriad of so-called geisa, taboos or prohibitions determining how the king must carry out his duties. Transgression of a geisa usually rendered the king impotent, destitute or dead and his kingdom turned to a wasteland. Kings were often no more than tribal chieftains of a group of related families or king of a province. 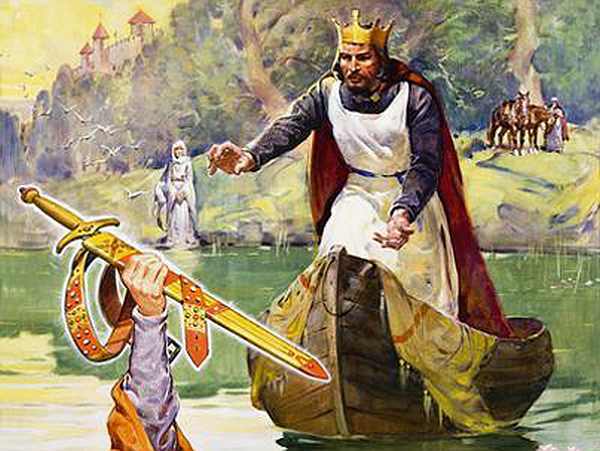 Longing for a hero of deliverance who would defeat the Saxon enemies of Britain and form an ideal kingdom, the Celts elevated Arthur to a heroic god of mythology. 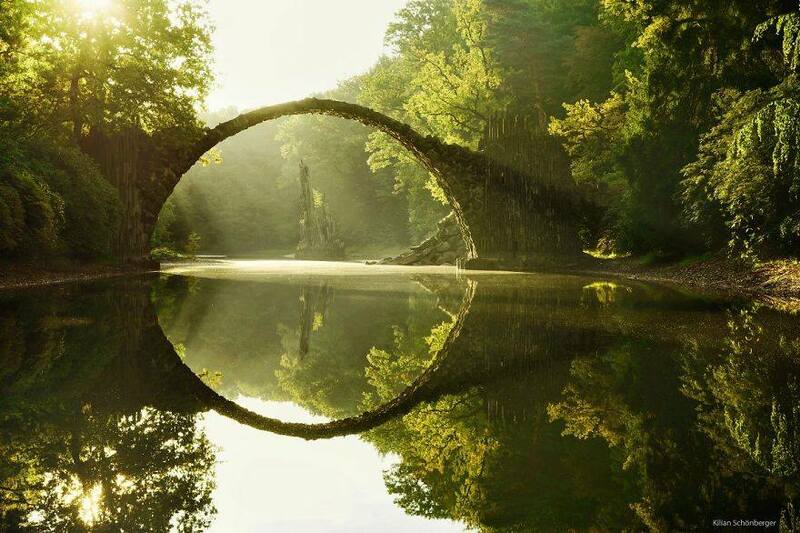 This was due in part to the historic reality of early Celtic tradition which only allowed for a king to be merely an intermediary, a bridge between his people; the Druid was actually the true Celtic chief. The Druid held the temporal, legal and spiritual or magical authority. If Arthur had been merely a king, he could not have performed his legendary deeds. According to Celtic tradition as king, “He was not allowed to leave his house without a valid; he was to admit every petitioner who came to see him and make him a gift. He had also to attend his army’s battles without actually fighting, for his presence was a prerequisite of victory” (Markale, 1994, p 144). 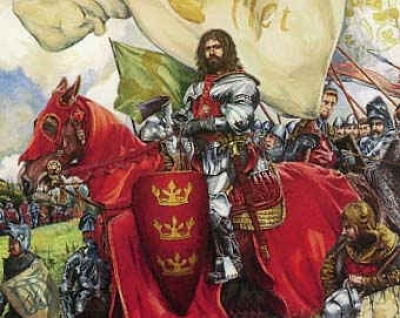 As merely a king adhering to Celtic customs and tradition, Arthur would have remained only a symbol of the community and would not have become a legendary hero of myth. Therefore the Celts turned their history into myth by deifying their historical characters of which a historical Arthur (who was not a king but a military leader) was made into King Arthur with the trappings of many ancient Celtic gods. However, the Druid Merlin of this myth still held the magical powers which proved necessary for Arthur to prevail in battle and to maintain a semblance of order among his many impetuous knights. Arthur may have possessed god-like attributes, but the Druid still held authority over spiritual matters and magical forces. Drawing the sword from the stone can be viewed as a test or initiation where Arthur proved himself as rightful king, but this sword was broken in a battle with King Pellinore when Arthur suffered grievous wounds which could only be healed by Merlin’s magic. Arthur had acquired the right to be king, but he did not possess the might to rule successfully. To do this, and subsequently gain the stature of a mythical hero-god, Arthur must cross over into the Otherworld where the ability to remain king lies with the Lady of the Lake, considered the Sovereign Goddess of the Celtic land and all of nature’s elementals. Upcoming posts will explore the role of women in Celtic society and the divine feminine in Celtic cosmology, the puer archetype and the sword and the scabbard as it corresponds to the Tree of Life. Markale, Jean (1994). King of the Celts: Arthurian Legends and Celtic Tradition. Rochester, VT: Inner Traditions. Other Sources include: The Story of King Arthur and His Knights by Howard Pyle, The Search For King Arthur by David Day and The Celtic Tradition by Caitlin Matthews.